Prior to Thursday, when I had the six bands placed in my mouth, I really haven't used the pain medicine with any regularity but the last few days I definitely have taken them and today was no exception. Ouch. Even though the swelling is considerably reduced it is obvious that I still have swelling. Apparently, it takes 8-12 weeks for the bones to fuse and you can expect to have residual swelling up to one year after this surgery. My jaws are still swollen also so I guess I need to get used to having a bit of chipmunk face for a while :) I will take some side profile photographs tomorrow to see how things look from that angle. 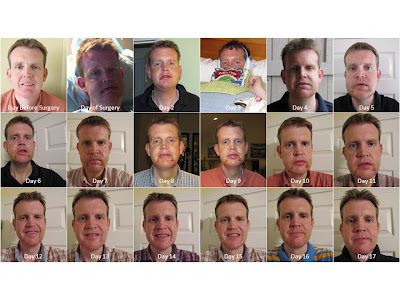 Given that I am feeling all swollen again I decided to put together another facial time-frame collage to see the difference in swelling, bruising, etc. I created a similar collage on day 10 so I probably will create one every 10 days. It takes a while to create but I think that they show the progression rather well. I had the best meal to date this morning for breakfast as my wife (thank-you so much!) made me the most delicious scrambled eggs (very soft and slupilicious) with pieces of sausages cut up and included in the eggs. Absolutely tasty and it almost felt like I was once again in the land of the living where eating food was concerned! :) Ah, I wish . . .
For the rest of the day and given my disastrous (and sad) experiment where eating was concerned yesterday, I reverted back to my tried and trusted diet of mashed potatoes and instant pudding for dinner. Oh, and I also had a Jamba Juice that some friends brought over this afternoon!